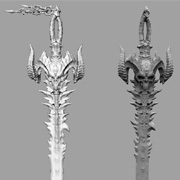 Part 6 of the Design a Legendary community project is available, and provides a behind the scenes look at the cosmetic details of the one-handed, Mephisto-themed sword. 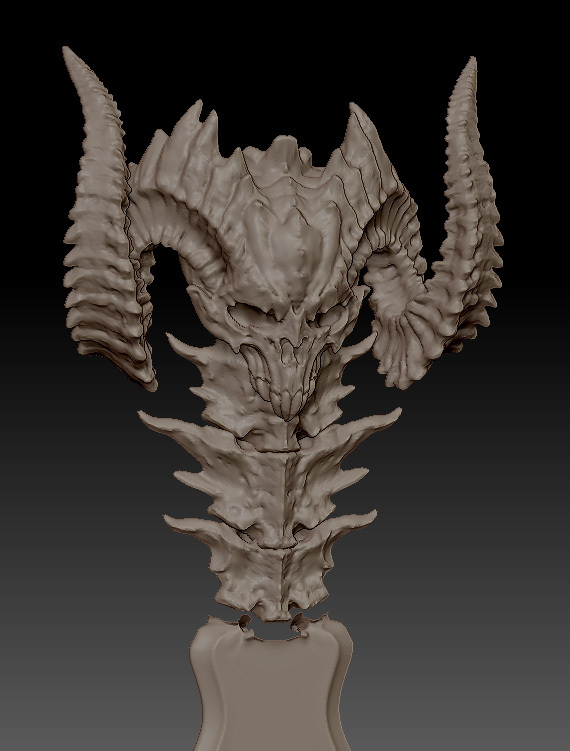 As we've published our different Design a Legendary articles, one request we've seen over and over again is to share more behind-the-scenes information about the visual design process in Diablo III. What's involved in creating an item's appearance? How long does it normally take? Who works on item art: is it one person, or many? Why is Aaron Gaines so amazing? And so forth. Well, we're happy to oblige! Read on below for a step-by-step process on how our community Legendary sword was brought to life, as well as a Q&A with Aaron himself. This whole process started with an initial piece concept art. 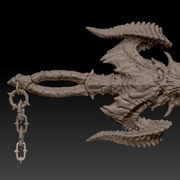 Knowing that the community had selected a one-handed, Mephisto-themed sword for the Design a Legendary project, Aaron began sketching a first draft in Photoshop. Next step: Iteration! After the intial concept was complete, Aaron created a second piece of concept art, also in Photoshop. This illustration would serve as the final concept piece and ultimately provide a visual basis for the in-game model. Before sketching this piece, Aaron made sure to pour over feedback from the community, making adjustments to the concept's design per player suggestions. Once Aaron finished the final concept piece, he used the 2D illustration as a basis to begin sculpting a high-poly 3D model. 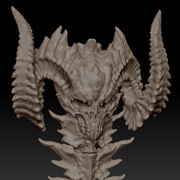 This work was done in zBrush. 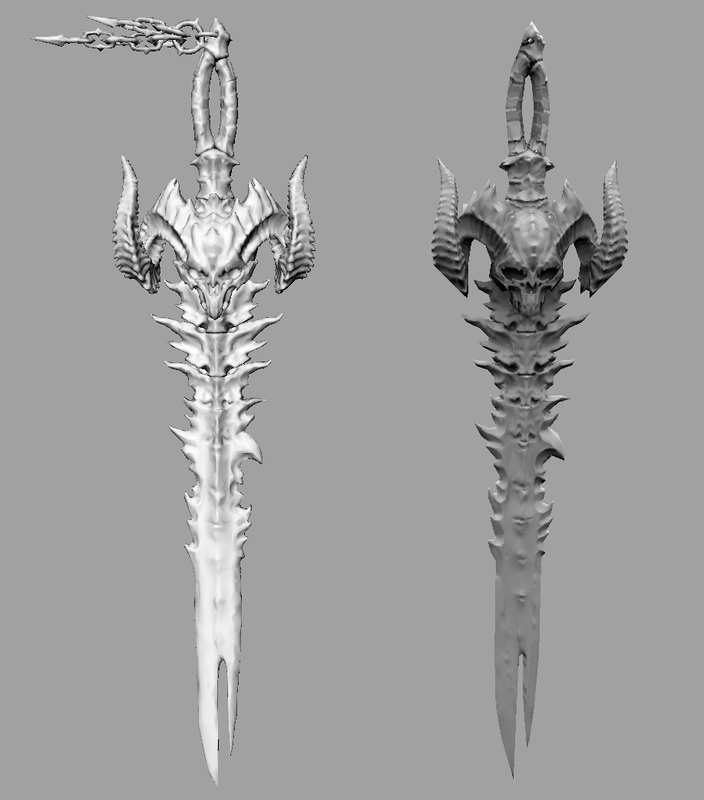 After completing the high poly sculpt in zBrush, Aaron created a low poly model of the sword in Maya. 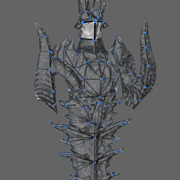 He then baked (or applied) the high poly sword texture onto the low poly model in order to create a detailed, but low poly version of the item that would be fit for use in the game. In the image on the right, you can see both the original low poly model (left) and low poly model with the applied high poly texture (right). 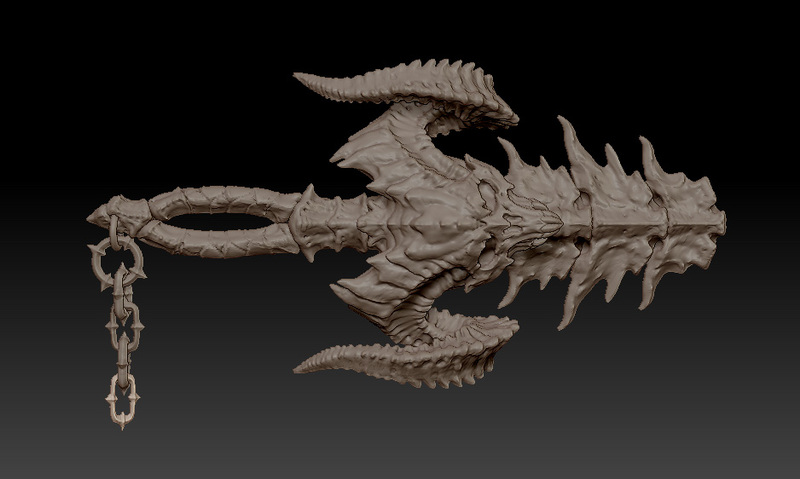 From there, Aaron "unwrapped" the 3D model to ready it for painting in Photoshop. For those who aren't familiar with 3D graphics, the way a particular texture is wrapped around a model is determined by mapping coordinates (often called UVW coordinates). Unwrapping is the process of laying out those coordinates flat so that texture painting can be done. To provide a very simple analogy, think of unwrapping a 3D model like breaking down a packing box to its original folding pattern or taking a globe of the Earth and rolling it out into a two-dimensional map. Unwrapping is an important step, as during this process the artist can adjust the UWV coordinates to minimize stretching and identify seams (or visible "folds"). Usually, the less stretching there is, the more seams there are, and vice-versa. It's all about balance! Thankfully, a clever artist can hide seams with a 3D paint -- which is exactly what Aaron did once the unwrapping process was complete. Once the texture paint was done, Aaron passed the torch to Jill Harrington, a senior technical arist on the Diablo III development team. Jill is responsible for the adding the awesome smoke-and-lightning effect (and making sure it animates properly as your heroes rofflestomp everything in sight) seen in the screenshot below. And there you go! The visual life cycle of Legendary, from concept (art) to animation. Pretty neat, huh? 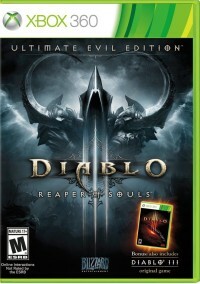 If you're hankerin' for even more information about how items in Diablo III are created, you're in luck! It just so happens we had an opportunity to sit down with Aaron and ask him a few questions (i.e. we emailed him the questions because we're gamers and it's more efficient that way) about his role in the Design a Legendary project. Check it out! Q. Tell us a bit about yourself and your position. 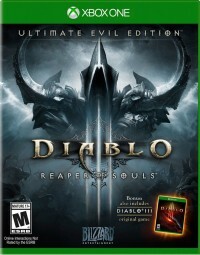 What exactly does a 3D character artist do in Diablo III? 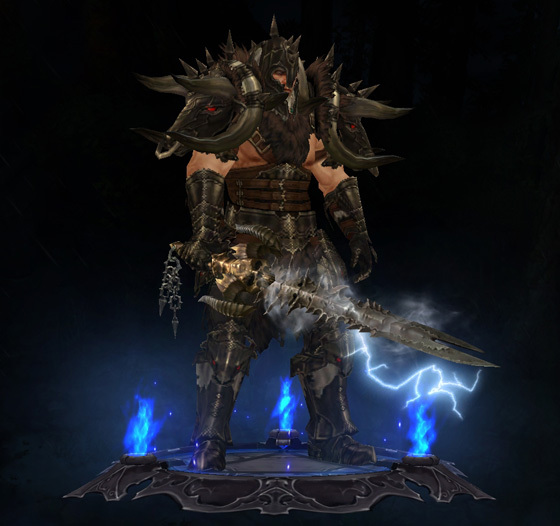 A character artist on Diablo III is a chimera of focused energies. Heroes, monsters, bosses, NPC’s, items, weapons, and armor are our bread and butter. Some of us do our own concepts, and some of us even have rigging, sfx, and scripting skills. My specialization is weapon design and creation. Q. 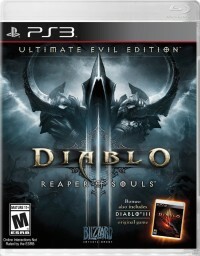 How many character artists are there are currently on the Diablo III development team who focus on item design? And how do you all decide who gets to work on which weapon? Currently, there are six character artists, and each one of us has a unique style and personality. It’s a great environment to work in. We all learn from each other and help each other to become better at our craft. If a needed asset is tasked to the character department, we will see if anyone wants it specifically. It could also get added to a list and then divvied out to everyone, or to whoever has the time. But for the most part, if you really want to make something you get to make it. Q. 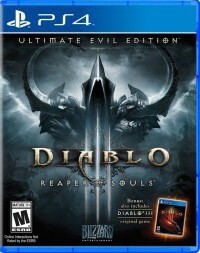 When approaching the visual design of an item in a game like Diablo III, where do you begin? 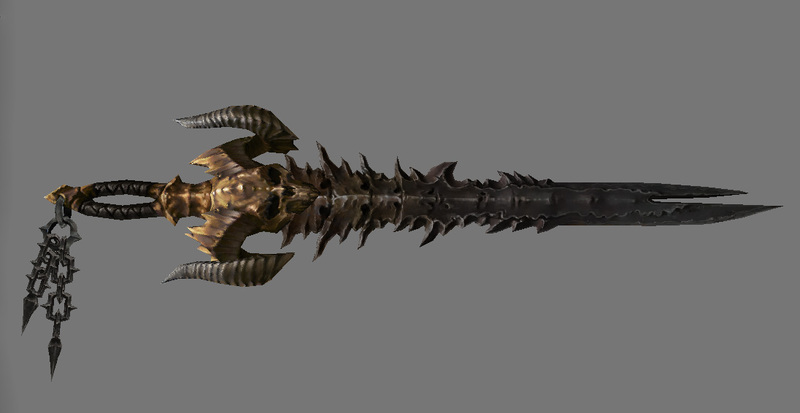 I could talk all day about what makes a Diablo III weapon a Diablo III weapon. I love making weapons. A while back, we came up with a rough style guide with that exact goal in mind; to give anyone working on an item some clear direction and understanding for their task. The main thing for me is to keep it in the realm of realistic, but still fantastical. We like to think of it as "low fantasy," whereas something like WoW is more high fantasy. Identifiable materials, themes, and strong, iconic silhouettes are a must for our camera angle. WoW has a very big, bulky, chunky design language that fits incredibly well in their world. For us, we need to be a bit more toned back, while keeping that epic Blizzard feel. It's a bit of a challenge, and I love doing it. Q. Can you tell us a bit more about the whole visual design process? For example, for those of us who have never designed an item for a game, what are all the different stages involved in bringing something that to life? Well, as in practically all game design, it never really goes exactly according to plan. Hah. Someone in design might have an idea first and write up some flavor text, for instance. Or someone will say "we need six new swords right now," and we have to scramble to get someone on concepts first then design where they go later. In an ideal scenario, the design team will need some art for an item they need. The concept team or the character team will do some rough sketches first and then a more finished piece based on what we all decided was the best one. 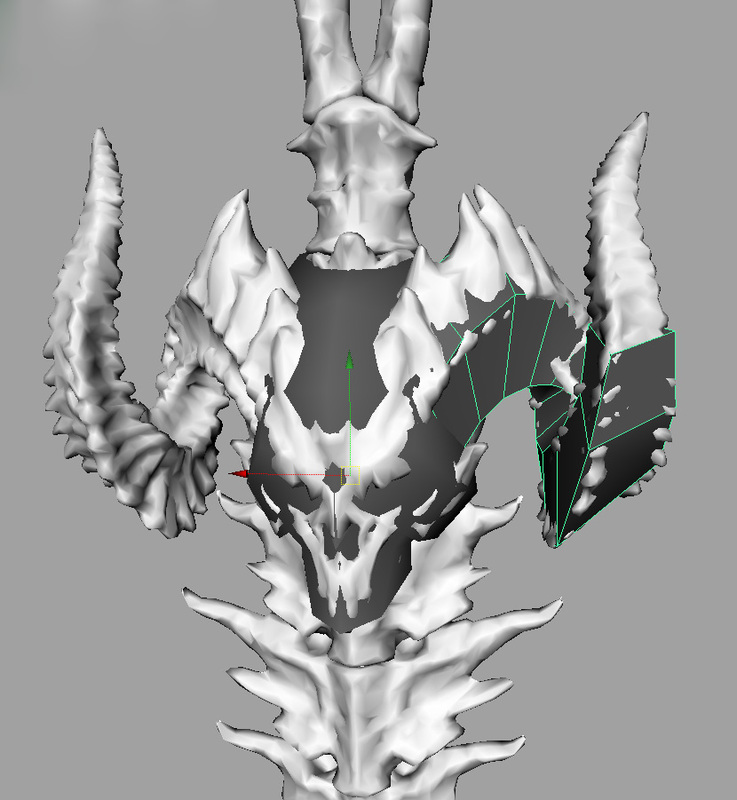 From there, it is tasked to a character artist and we model it, then paint it, then export it into our game using our tools, and then everyone says AWW YISS THAT'S AWSEOME. And we eat cake and celebrate. Q. How long on average does it take to go from concept to creation for an in-game item (particularly a Legendary item) -- at least from the visual side of things? Legendary items more often than not take a bit longer than standard items due to their super sweet nature. Usually anywhere from 1-2 days for a concept, and then 1-3 days for the creation. 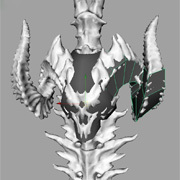 Helms and shoulder pads take longer because we have to manually fit them to all the classes, male and female. I'd say a week to be safe, but they’re often part of a group of items which has a longer deadline so it’s tough to really say exactly. Q. 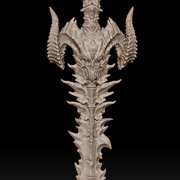 So, for our Design a Legendary project, the community decided that we should make a Mephisto-themed one-handed sword. That's pretty exciting to me! Can you walk us through how you approached translating that information into the design of this particular weapon? I started by being excited because I love Mephisto, and apparently, so does everyone else… which is awesome. After that it was a mix of successfully translating the idea of the item visually and then taking into consideration some of the awesome suggestions from the forum posts. I’m really happy how it turned out. Q. 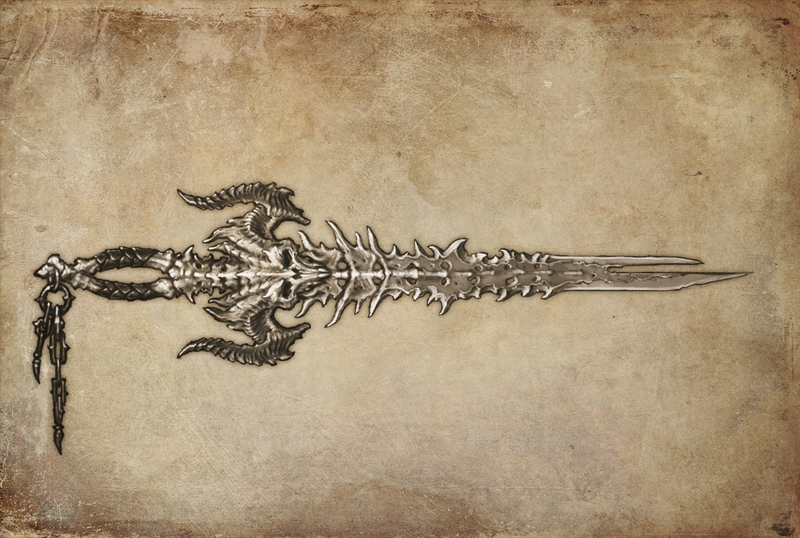 What's your favorite part about this weapon? My favorite part is the wickedness of the blade I think. It looks like the mouth of a tiger shark badly in need orthodontics… and I wouldn't want to get hit by it. Q. What part of its design was the most challenging? Making sure it was iconic enough and didn't get too busy. There is a lot of stuff going on in this sword. Picking the right things to be focal points and keeping other things as supporting visuals was the key to keep it in check so it doesn't look ridiculous. Q. Any recommendations for aspiring artists out there? The best advice I can give is to never stop believing in yourself, never stop absorbing inspirational material, and never stop doing art. Unless you're some sort of alien savant, you aren’t going to become a master overnight, so the old saying " practice makes perfect" very much applies. Also know when to be finished. You can noodle away at tiny details of something forever, but you have to move on to the next piece to learn from the last piece.